Buttery and cake-like in texture with an ornamental, fluted shape, the madeleine is quite likely the most beautifully described cookie in literary prose. For it is the taste of a madeleine dipped in tea that sets into motion a vivid flood of memories recounted in Marcel Proust’s fictional novel, A la Recherche du Temps Perdu. Traditionally a dry cookie, perfectly conducive for dunking into a complementary cup of tea, this madeleine recipe combines the elements of tea and cookies in a singular elegance. The citrusy flavors of bergamot (from the tea) and orange (from the zest) play brightly in the foreground of these delicate cookies, while brown butter provides a nutty base. Although it may seem a bit unusual, adding ground tea directly to the batter creates lovely flecks of texture (not unlike a poppy seed) in addition to flavor. Grind loose tea leaves in a coffee/spice grinder or with a mortar and pestle and use straight away for maximum freshness. Heat butter in a small saucepan over medium heat. Allow the butter to melt and then continue cooking, swirling the pan often to prevent burning, until it turns light brown and gives off a nutty aroma. Cool completely before using. Meanwhile whisk together the flour, baking powder, ground Earl Grey tea, and salt in a separate bowl. Preheat oven to 400° F. When ready to bake, remove the plastic wrap, place the madeleine pan on a baking sheet in the center of the oven. Bake 11 to 13 minutes for large madeleines or 8 to 10 minutes for minis, until golden and the tops spring back when gently pressed. Remove the pan from the oven and release the madeleines from the molds by rapping the edge of the pan against the counter. Transfer the cookies to a rack to cool to just-warm or room temperature. 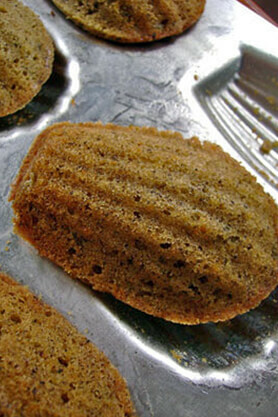 Madeleines are best eaten shortly after they come from the oven, so try to time your baking to your serving time.